This weekend has been an enforced sit on the sofa weekend . Quite enjoyed it really, but don't tell anyone. With the TT around the corner and inspiration from watching lots of bikesport on TV today, I sent a text to my daughter asking if she would mind buying a weekly motorcycle paper from the shop on her way home. Just 20 mins ago it arrived on my lap, life of luxury! Now I'm sitting here thinking of all that I could've done with the £1.99 price. The first glance through made me think I must have missed the first section, cup of tea and then find those missing bits and read a bit more........But there isn't a bit more?.. Now, I class motorcycles as a huge part of my life, I make them for fun, I restore them for fun (and a little for my living). I have fantastic memories of racing and look forward to more racing in the future, I have often helped with events and even run my own little gatherings. I study their engineering and the engineers that create these machines. I follow motorcycle sport and I tour. Every week I ride to commute many miles in all seasons. Why then am I left empty, not for the first time, after reading this weekly two-wheeled tabloid? Why can the little, low production, tiny budget magazines; Dice, Dirty Magazine etc. have me clutching them close by, just to grab a second or third read from their now dog eared pages followed by many inspirational hours of contemplation? Why do I not get it? Having read the "Tethered Racing" article in the latest edition of "Dirty Magazine", I think these little cars are really good. So sad it's the last edition of a brilliant little magazine. Thank you to Scarlett, Simo and all for your hard work. Horsemen Cometh: Why We Love the Mustang from AirShowBuzz on Vimeo. Thank you to MotoFreako blog http://blackcountrybiker.blogspot.com/ for bringing this to my attention. Early this month I removed the rear cylinde block to assess the rear pistons and sleeves. This engine doesn't seem to be terribly badly worn. It is interesting that most of the sleeve/bore wear takes place on the fore and aft of the cylinder, not the thrust side as a conventional engine? I haven't thought this through yet. Why didn't I just press the "start" button? Sorry but I can't seem to make the link work, it will have to be entered by hand? Entering Blog links, photos and videos doesn't seem as easy as before, is it just me? My old Harley has been off the road for many years after a failure of the electronic ignition. As I am old fashioned I modified it back to points....that way I can fix it at the roadside. The mod was over three years ago and I never got round to trying it out. A few weeks ago, a friends "wife to be" called in and persuaded me to sort the Harley to become a surprise transport for his arrival at the ceremony 7 miles away...... and I said yes of course. Work and deadlines stopped me from doing anything more until just a few days before, the test ride was to the MOT and then the wedding the next day. I was more nervous than Dave when I arrived, what if I broke down. But all was well. some comfort taken by the empty pillions of some of the other bikes that joined us. Great Day. Cheers and best wishes to Dave and Sara! Big Round Engines, Propliner Nostalgia. Recently the second series of Ice Pilots has been screened on Thursday nights (Quest Channel). Although the drama is accentuated and sensationalised for an audience by the production team, you can see the core of real drama and feel the tense situations of those flying in the Alaskan winters. These old Radial engined propliners are so special, the sound of a Wright Cyclone, Pratt and Whitney or Bristol Centaurus in real life will always raise the goosebumps. 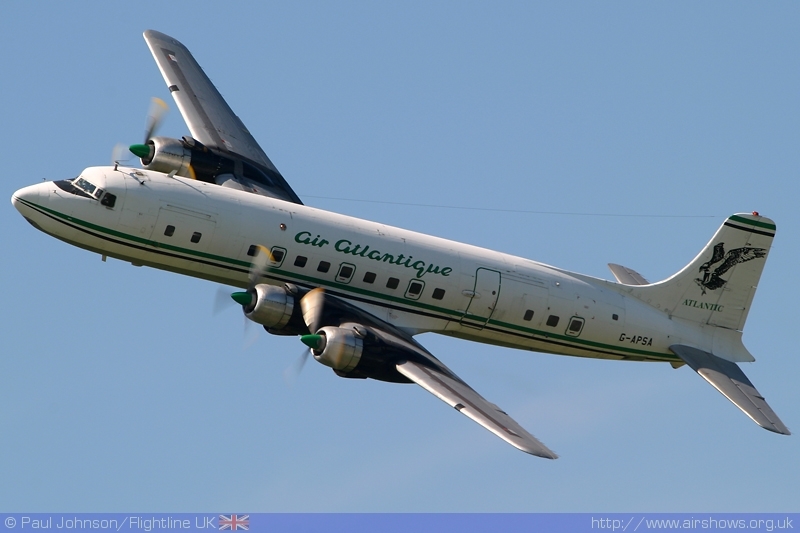 For a year or so I was very fortunate to be a little involved with a Coventry based company called Air Atlantique. 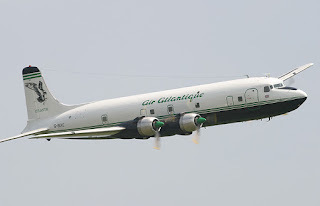 Here they operated DC3 "Dakotas", DC 6 and many more old working aircraft, genuinely earning a living in coastal patrol and environment work and offering last minute, urgent cargo transport facilities in a way that the larger jets could not compete. Having borrowed so many pilot story books from the mobile library as a youngster (my future father in law was the mobile library driver and on introduction by his daughter, remembered me as the boy who kept ordering Spitfire books over and over!). My time at Coventry became a little bit of those story books, lunch breaks were savored amongst all of these old piston engined machines....the best perhaps, when you were in a meeting or in a classroom and had to halt all conversation because of the cacophony of a DC6 starting each of those four big radials just outside of the window, followed by another later pause as she thundered by on her take off run.... heaven. Wing changes were often in progress on the DC3 aircraft, I think that the wings could be swapped to maximise the available parts and fatigue life. Each wing is held by a ring of 3/16" bolts around a flange section. The Airline industry is always likely to be at the mercy of world events, this certainly became the case in the beginning of the new millennium. For me it signalled a time to settle back to a more reliable career in something I had not really left, engineering. But always it will be in my memory that just for a while I was almost part of those aviation stories waiting to be read by the next generation. It has been an eleventh hour attempt to finish the Morris. She is expected for a big family event, typically has suffered from the 20 month lay up. Battery failure, starter motor sticking and fuel pump and system faults all standing in our way! The start and initial settings have been by hand cranking, thankfully that has been OK. Almost there now, road test tomorrow and MOT Wednesday, hopefully! It's been really difficult to get back to working on the bikes. I did make a footrest to replace the rubber BMW item. This is made of aluminium, sleeved with thin wall steel for strength and to allow a steel section to locate the retention pin. This is riveted with copper rivets which also provide a bit of grip. I've only done this side at the moment, later I will slightly tidy the rearset linkage. I think I'll carry the "aluminium and copper rivet" theme through a few more places, although, I don't want to overdo the rivets. I really don't like doing the end of month paperwork, I should spend the full day on the computer...but I escaped! Well for a couple of hours this morning. My German Shepherd is a constant companion in the workshop. She is sadly just reminding me of her age now looking pretty tired at the end of this climb, actually me too. I don't really know much about trains but I really appreciate the engineering. This fine locomotive is looking very British, taking on water as I walked by the station. 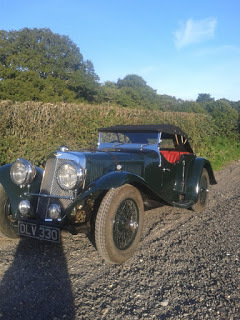 Some further Delage DISS photos. All showing initial assessment stages. The engineering is very fine. There are some unusual little touches like the spring "fox" clip. Normally these are riveted to secure in to position, not with these, very elegant!